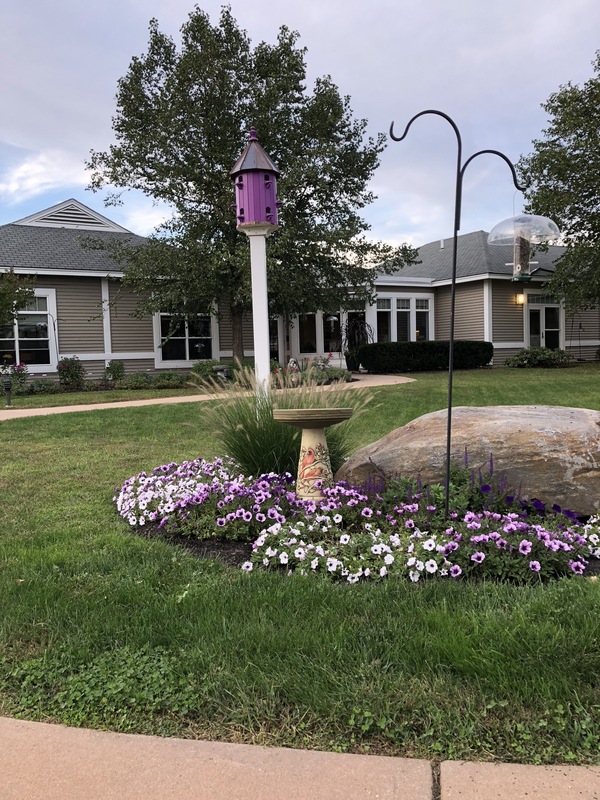 Hyder Family Hospice House, in Dover, NH, has served over 800 guests, plus their families and friends since Strafford County Master Gardeners Marie Van Guilder, Amy Van Splunder, and Lynn Aber began gardening there in 2016. Last year, Master Gardener Interns Karen Little and Ann Windsor joined in. The site is currently nurtured by the three original MGs, plus several community volunteers, ranging in age from teens to octogenarians. As part of the MG education mission, all plants are labeled, a pamphlet for each guest room is in the works, and we advocate organic practices. This series of gardens – which everyone is welcome to visit – consist of two major areas: a public Welcome Garden at the Entrance and a more private garden to the rear. Effort has been made to create year-round interest in both spaces. 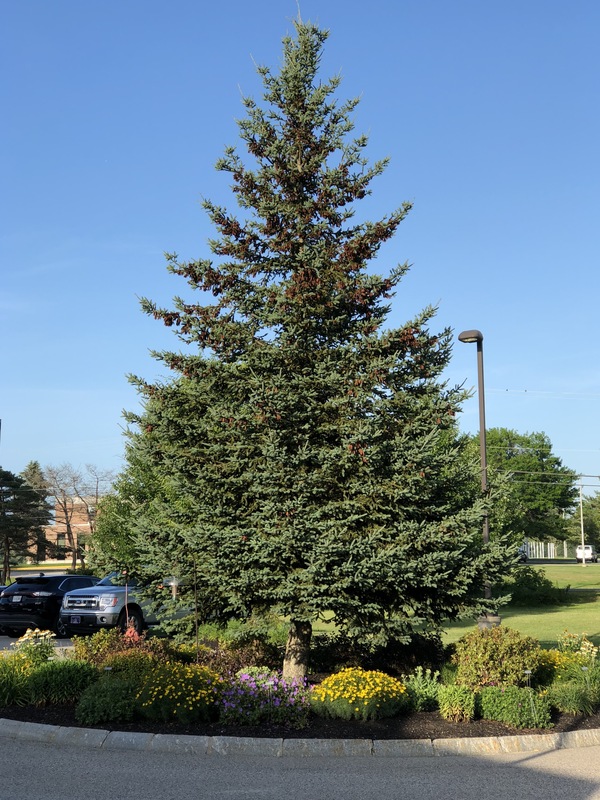 The circular front garden, dominated by a conifer and home to a fire hydrant, is perhaps most alive with color in Spring and Summer with flowering shrubs, bulbs, and perennials. Many guests’ rooms face the rear garden, paths, patios, and meadows. Here, a tall purple bird house creates a focal point, thanks to Amy and her husband. We think that all gardens are works in progress. This one thrives with generous support from many sources including: Wentworth Greenhouses, Gardeners’ Supply Company, American Daffodil Society, and Friends of Hyder House. Director of Hyder House Hospice, Dee Brown, says it “has made a world of difference” and a Catholic priest who spent his last days here considered it a preview of Paradise. We are humbled and encouraged — many thanks. 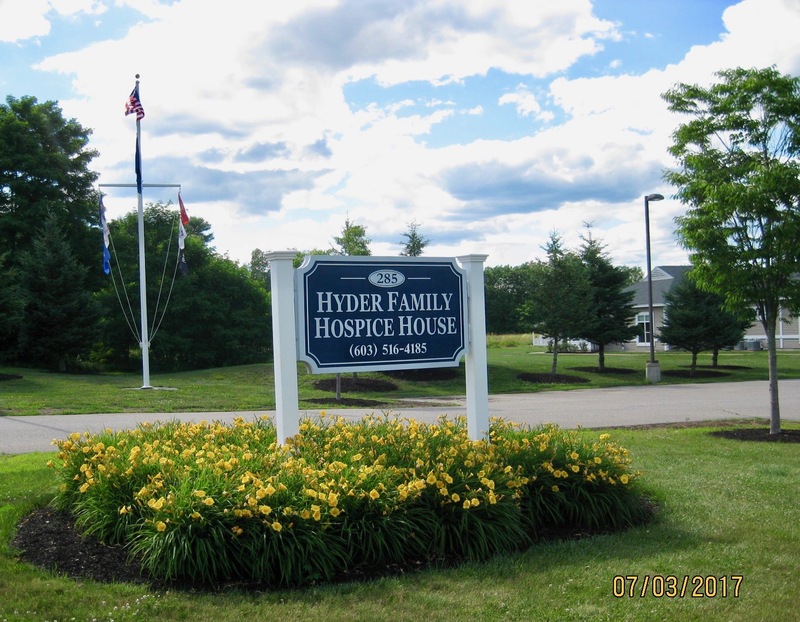 If you want to learn more about Hyder Family Hospice House, you can find further information on their website or follow them or the Friends of Hyder Family Hospice House on Facebook. This entry was posted in SCMGA Projects and tagged American Daffodil Society, Friends of Hyder House, Gardeners' Supply Company, Gardening, Hospice, Hyder Family Hospice House, Master Gardeners, New England, New Hampshire, Strafford County, Strafford County Master Gardeners, UNH Cooperative Extension, Wentworth Greenhouses. Bookmark the permalink. As one who has been blessed by the skillfulness and kindness of hospice, I can deeply appreciate the value of the gardens. What a beautiful gift to that place and that time of life. Lovely article. Love the photos.